The implications of plant potash levels on drought stress are often discussed during the spring due to the role potash plays in enabling efficient water usage in plants and improving crop tolerance to drought. Drought conditions are not only related to potassium levels in the plant but may also have an impact on nutrient levels in crop residues at the end of the season. This season’s prolonged dry spell during the build up to harvest has encouraged some crops to senesce prematurely. Although it is far from an exact science, the result may have implications for residual nutrient levels in straw. 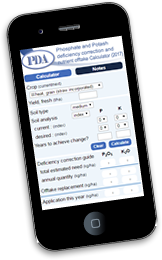 The figures used as a guide in the Fertiliser Manual (RB209) are based on averages from many samples collected over a number of different seasons. Although there is little work available to quantify the variations over seasons, it can be assumed that dry seasons will lead to higher nutrient concentrations in crop residues. Anecdotally, removal concentrations in the US are higher than they are in the UK, which may in part be associated with the lower levels of rainfall at harvest in the US. In situations of premature senescence not all of the natural plant processes are completed, as seen with pinched grains due to a shortened grain fill period. Peak potash uptake in crops is reached around flowering, after which time, the levels begin to fall. Late in the season potassium is required to transport carbohydrates to the grain during grain fill. In years where the grain fill period is shortened and grains do not fill to their full potential, such as this year, this may lead to elevated potash levels remaining in the straw at harvest. Whilst straw prices have risen over the last 12 months due to supply shortages, it may drive decisions on farm to remove a greater proportion than originally planned. Where straw is removed from fields this summer, greater consideration needs to be paid to fertiliser strategies and calculations of replacement values. Large differences occur between replacing P&K removed in the grain only, and that which is removed in the grain plus straw, as can be seen from the table in the Fertiliser Manual shown below.